Yesterday I arrived to Vikasa and it felt like entering a paradise. What a place this is, better than I ever would imagine. 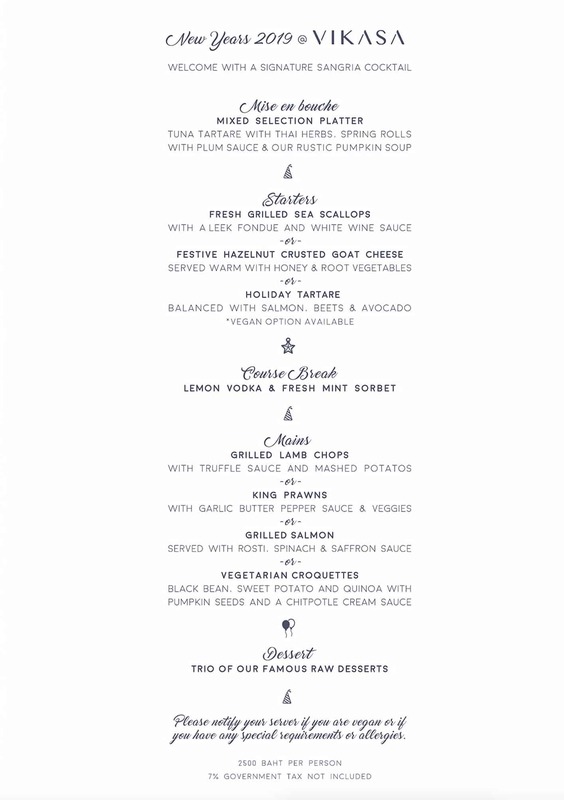 The location by the ocean is perfect and the view from the restaurant is wonderful. I’m staying in a bungalow by the beach. I woke up this morning and the first thing I saw was a beautiful sunrise. I just had to go out and sit on the rocks and take it all in, realizing that I’m finally here fulfilling my dream. After a morning yoga class I went to the café for a delicious brunch. There are so much to choose from, vegetables, lenses, eggs, chia pudding, fruits, pancakes, juice, coffee and tea. I had some time to look around and went for a swim in the infinity pool before I had a massage at the Bliss Spa. After my long flight yesterday it felt so good to release tensions in my neck and shoulders. This afternoon I spent on my balcony. I have a lot of thoughts and many questions. Am I going to manage this course? What about speaking and understanding the English language, is my English good enough? 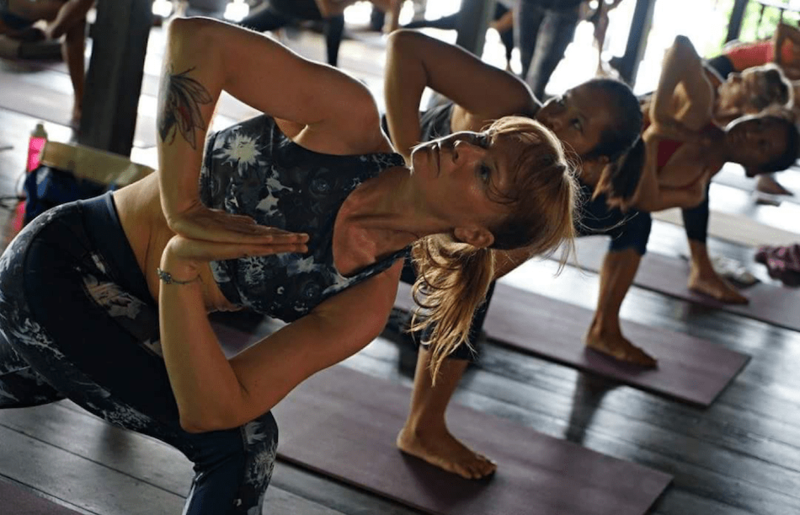 Is my yoga practice strong enough? Am I flexible enough? Then I read the welcome letter from Kosta, his words helps calm me down. Yes, I’m going to be all right, I’m good enough, I won’t have any expectations. After the buffet this evening we all got together and had a short meeting and our teachers introduced them self. It was so exciting to see everybody that’s going to attend this course. I’m so curious and eager to get to know them all. I’m really looking forward to tomorrow when we are going to start off our day with a yoga class that Kosta is teaching. And we are all going to get to know each other and present ourselves. This was a fantastic day, so powerful, so emotional and so educative. It started with an energetic morning practice with Kosta. We spent a lot of time focusing on our breathing, learning more about the Forceful Ujjayi breathing technique. The deep, mindful breathing really helps during the sequence, to focus, holding postures, balancing and staying calm. After our brunch I stayed study in the café. I really like sitting in a bean bag, under the fan looking over the ocean. I feel so privilege being here at Vikasa. At our Group Dynamic class with Alicia we learned more about our Root Chakras. We paired up and talked with our friend about our dreams, our biggest fears, and a time in our life that was challenging. I got paired up with Ida from Denmark. I hadn’t had the opportunity to talk so much with her before, but right away it felt so good to open up to her and share my thoughts. It got very emotional at one point and Ida was so comforting and lovely to me. She is so sweet and I’m so grateful I got to share this experience with her. In the afternoon we had an interesting lecture with Jason, we talked about ‘What is yoga’, Tantra and Chakras. And his Yin class was wonderful, it helped me calm down, focusing on my breath and open up my body, letting go of things that no longer serves me. It’s so nice to sit down together for a delicious buffet and talk with all my new friends. We have a lot to talk about and to share with each other. Woke up this beautiful morning to sit out on my balcony to enjoy an amazing sunrise. I looked through the sheet of Sequence 1, today we had self-practice in the morning. It’s a hard and challenging sequence, I love that. Relaxing in my Shavasana at the end was a powerful experience where I could feel a lot of energy flowing through my body, felt terrific. After our brunch this morning I went to the Vikasa Beach with Johanne, who is also from Sweden. We had a long interesting talk, we talked about our dreams and fears and it felt nice to support and inspire each other. Today we talked about our Heart Chakra and Alicia guided us through a meditation filled with love. It was absolutely lovely, feeling the presence of my two boys. I miss them! We finished the class by giving each other massages, so wonderful. And then Jason taught us more about nutrition. This is so interesting and I very useful knowledge. The afternoon ended with a Yin class with Alicia, a lot of great hip opening postures. At dinner tonight there where a lot of fun and laughter. And in the evening some of us went for the ecstatic dance with Niki. It feels amazing to dance like this, to let go and let your body move any way it wants, there are no wrong, do whatever feels good. To let all the energies move through your body and just feel so alive. Slept like a baby after this. Tomorrow is our first day off. Today I feel really strong and happy, lots of positive energies. The day started with a morning yoga class with Jason, a lovely flow that I really enjoyed. And after our brunch I joined some of the girls to the beach for some sun and bathing. At our Group Dynamic class today we were focusing on our Solar Plexus Chakra. We got time to sit down and think about our dreams and what we wish for in our lives. I can definitely see teaching yoga and continuing my spiritual journey and also a lot of travelling being part of my dreams. In the afternoon it was so interesting to listen to Kosta telling us about his journey. He is so inspiring to listen to. How he dreamed big and managed to fulfill his dream of building up Vikasa. That if you are passionate about something and work hard it is possible and also how important it is to make contact with people and help each other out. To believe in yourself and see the opportunities. To see the signs, follow your intuition and don’t give up. After dinner and a lovely spiritual conversation with my friends I went back to my bungalow for a relaxing evening. Talked to my family back home and did some reading and drawing a picture. This morning we started with pranayama and meditation and it felt so good. My meditations are getting so much deeper now and I find a nice focus and feeling the energies moving. Today at our Anatomy class we had group presentations. Each group have got two different postures that we were going to present for the others. The Anatomy lectures has been so interesting and I have learned so much from them. 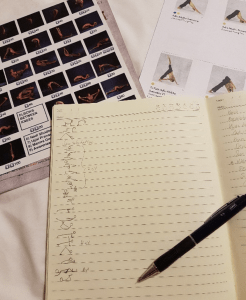 So much useful information that really help me understanding and getting even deeper in my postures. We had a self-practice class in the afternoon, this time it was Sequence 2. This is an excellent Sequence that I love to practice. After the class I felt full of energy and I could really feel how hard my body had worked. I could use the tips from Anatomy class, I could especially feel the differences practicing wheel and twisting. Tonight had a wonderful and fun time with my friends at dinner. We can talk about anything it feels so good to be able to share thoughts, feelings and laugh together. I’m so grateful for all my new, beautiful friends I met here. Before I went to sleep I prepared my Sun Salutations that I’m going to teach to a friend on Monday. It’s going to be so much fun to teach each other. I’m a little bit nervous about speaking English, but I keep telling myself I’m going to do just fine. Tomorrow is a day off and I’m going on a boat excursion, snorkeling, kayaking and hiking. I’m excited about that. I can’t believe we’re already half-way through, time run! Had an amazing morning class with Kosta teaching us. It was a lot of focus on our breathing and it was a wonderful flow. I get so inspired and I pick up a lot of ideas of how I want to teach my own classes when I get back home. The class ended with a meditation that felt very intense, strong feelings of energies passing through my palms and seeing a lot of color. It feels so good, calming and harmonizing. After our brunch me, Anne and Annika went to Crystal Beach. It’s a fantastic, beautiful beach located only 5 min away. I had my snorkel gear with me and spend some time with the fishes and of course relaxing at the beach. We also treated ourselves with massages. After all the yoga practice it feels wonderful to loosen up my muscles with a deep tissue massage. Suddenly the rain stated pouring down outside, it was so powerful to lay down listening to the forces of nature. Back at Vikasa it was time for our Group Dynamic and today we talked about being able to say no to people and no to doing things and we got to practicing it in a role-play. Then it was time for our first Philosophy class with Ram, I’ve been looking forward to this a lot. He started the class with a beautiful chanting about Ganesha. And he started telling us about the Vedas and Bhagavad Gita. These classes are going to be so interesting. In the afternoon we were teaching each other pranayama and bandhas. This is such a good practice and you learn a lot about how to explain different techniques. We also continued working with adjustments and assisting each other in postures. 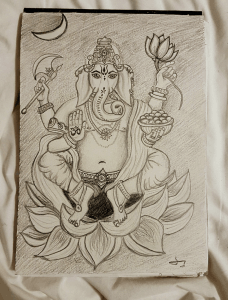 After our dinner I went back to my bungalow and inspired by the chanting earlier today I drew a picture of Ganesha. Woke up this morning and listened to the thunderstorm outside, so powerful. I went to the yoga shala early to prepare my yoga sequence. Today we were going to teach each other one by one and I was really looking forward to this. 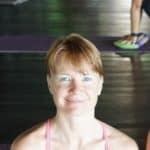 We have put together our own one hour class with pranayama, sun salutations, a sequence and alternate nostril breathing. I was paired up with Bobbie-Lee, my sweet friend form Canada, and she was so supporting and sweet. It felt so good teaching and it was so much fun, I learnt a lot from doing this practice. I also enjoyed being taught by Bobbie-Lee she had a fantastic sequence and a lovely way of leading me through her class. After our brunch I went to receive a Reiki Healing from Jason. This was so wonderful, getting my energies balanced and I felt really relaxed and calm after my session. Right now I have a lot of thinking going on, planning and many questions about my future and what’s going to happen when I come back home. This session helped calm my mind down and to let go of worries. Then I stayed relaxing by the infinity pool feeling all the good energies flowing in my body. Our Group dynamic class was about our heart Chakra and we worked with feeling the love in our hearts and eye gazing. After an interesting Philosophy class it was time for Kosta teaching another one of his amazingly good yoga classes, challenging and fun. Tonight we went to the Fisherman’s Market for some shopping. We had so much fun, I found some nice clothes and a beautiful Mala. This morning it was my turn to teach my yoga class to a group of four. At first I was a little bit nervous but after a few minutes it felt really good and I calmed down trusting that I know what I’m doing and just enjoying it instead. It helps to look at my students, seeing them smile and supporting me. Yes, this is absolutely something that I want to continuing doing when I get back home. I feel ready to start teaching and I want to spread and share my love for yoga. My students and also Kosta and Jason were happy with my class giving me positive feedback and confirming the good feeling I had about it myself. I felt so excited and joyful after this class and eager to get to teach another class soon again. At the Group Dynamic class today we got to write a letter to ourselves. What a perfect day to do this. Everything feels so good, I’m motivated and excited. I can see a lot of opportunities and possibilities. If I haven’t started teaching once this letter reach me back home this will be a perfect boost, my own words, telling me to do it, don’t be afraid, that I am ready and that I should follow my dream. Spend my evening studying for our exam. Fell asleep with a big smile on my face, feeling happy. It’s graduation day!!! I’m a yoga teacher, I have fulfilled a dream, and today I’m feeling happy and proud of myself. I made it and I loved every moment of this course. But I also feel a bit of sadness, that it has come to an end, I’m leaving this paradise and all my new lovely friends. I’m going to miss this place, my teachers and my friends so much. At the same time I’m excited to get back home and start teaching, and of course to see my family again. Started the day with a magical Yin class with Alicia teaching. It was a class filled with feelings of love and happiness. Today we stayed eating our brunch for a long time, enjoying the delicious food, the beautiful atmosphere and each other’s company. Talking and laughing and having a wonderful time together. 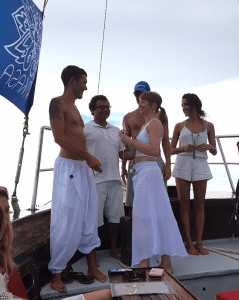 In the afternoon we get together at the café, to be picked up and transported to the boat, where we had our ceremony with diplomas and celebrating! Everyone was dressed in white, everyone was glowing of happiness. The boat ride was amazing, so much joy and love. It was a very special moment to receive my certificate saying I’m a yoga teacher. To share this experience with these beautiful, loving people is a true gift and I feel rich. We had a really good time on the boat, jumping in the water for a swim. We came back to Vikasa in time for our evening buffet and after our meal it was time to say goodbye to each other. This is so sad, but we will stay in contact and keep supporting and sharing our love and inspiring each other. I have got lovely friends all over the world, I’m so lucky. Back in my room I spent some time reflecting over everything that have happened this last month. I thank myself for doing this, for taking the chance, to follow my dream! This is absolutely one of my best decisions I’ve made. Four week since I graduated my yoga teacher training at Vikasa and these last couple of weeks back home in Sweden have been amazing! 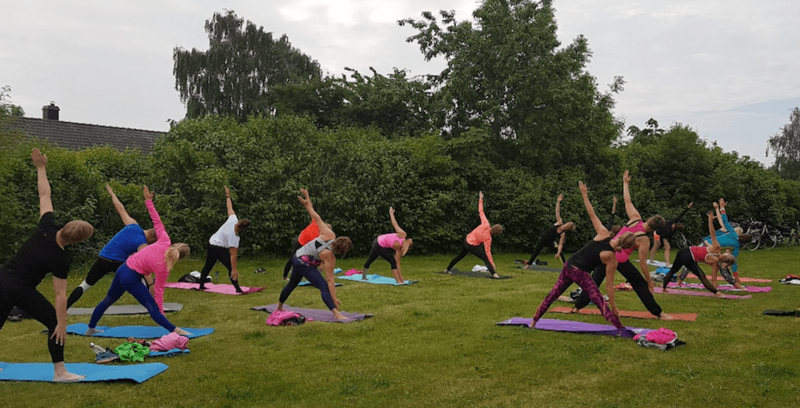 Four days after I got back home I felt ready to teach and I decided to post an event on Facebook, inviting friends to come join me for an outdoor yoga class the next day. 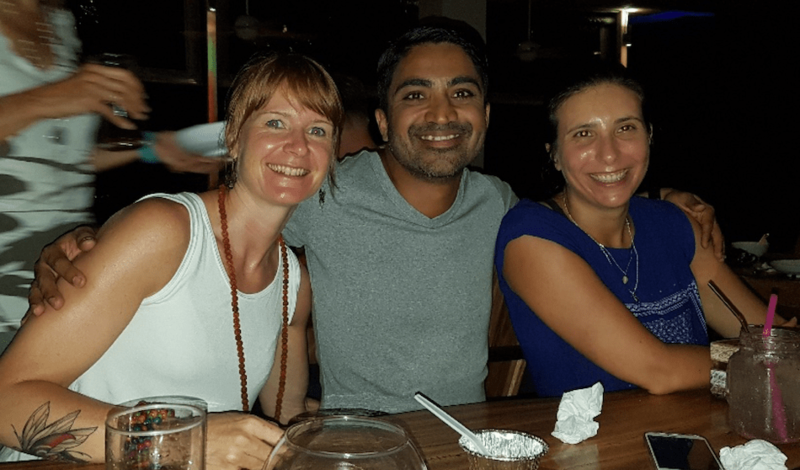 I was so surprised to meet up with 17 enthusiastic people that wanted to try yoga, there were both friends but also people that I had never met before. And they were all so grateful for me doing this. It felt fantastic to share and teach. The word is spreading and more and more people are coming to my classes. 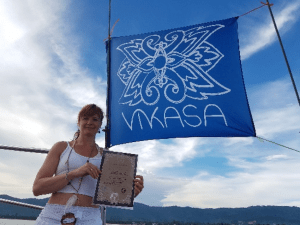 I am so happy that I decided to do the teacher training at Vikasa. I learned so much that I now can share with others, but most important I learnt to trust myself, that I’m good enough and to not be afraid to try and to follow my intuition. Now I am having outdoor classes in the village where I live and I teach in a small yoga studio in down town. 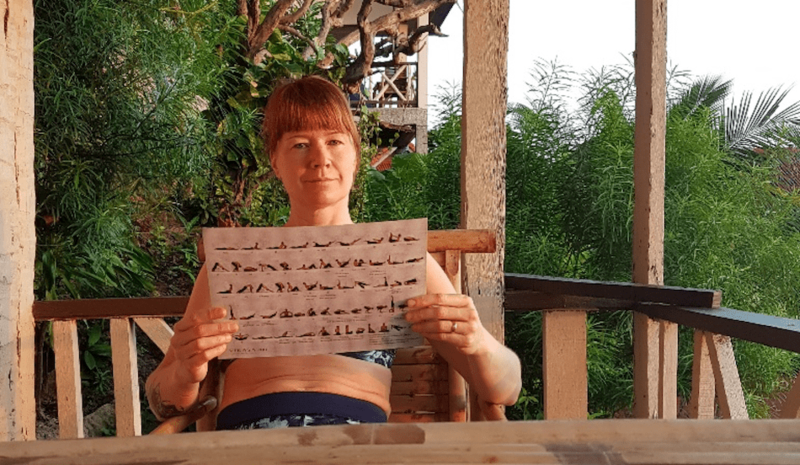 Starting in August I’ll be teaching regularly at the yoga studio and I have also rented a place in my village so that I can continuing teaching indoor when it gets colder. And I have started my own company Jen Jen Yoga. 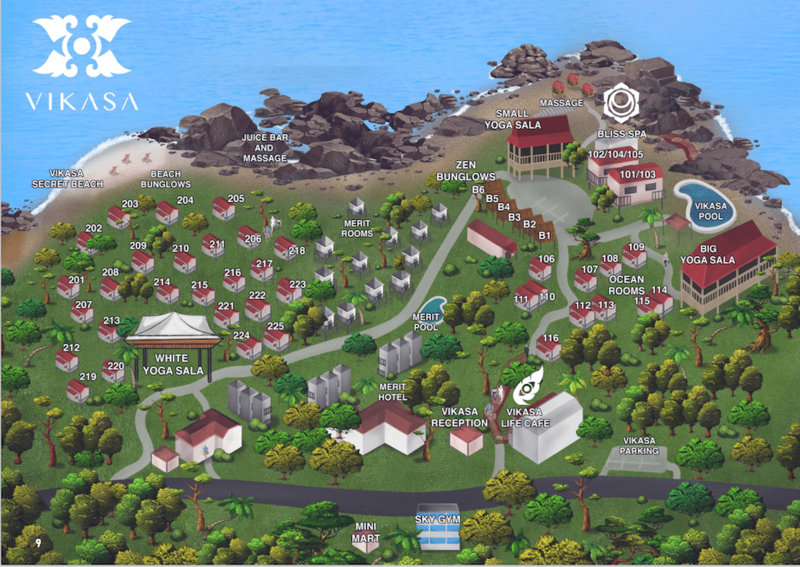 Of course I miss being at Vikasa, all my friends and teachers! But I know that I’ll be back at Vikasa one day!